The Comedy Barn is the funniest show in the Smokies 14 years in a row! Featuring nationally known clean family comedians, jugglers, fire-eaters, unique characters, ventriloquists, live country and gospel music as well as fun barn yard animals including a mind reading monkey. You will laugh your socks off at the "America's funniest family variety show!" The Miracle Theater in Pigeon Forge, TN is a stunning musical recreation of the life of Christ told in epic proportion. Featuring an enormous cast of actors, singers, dancers, technicians, and live animals, you will be awed by the magnificence of this performance. The curtains will rise on the dawning of creation, as the fingerprint of Christ is illustrated throughout the Old Testament. You'll be inspired and renewed as you witness the glory of The Miracle in Pigeon Forge, TN. Brand new for 2010 is Joseph and the Amazing Technicolor Dreamcoat. This Broadway hit with music from Andrew Lloyd Webber and Tim Rice is an entertaining look at the life of Joseph and his coat of many colors. Great for the whole family. The Black Bear Jamboree Dinner and Show is a $10 Million Dollar High-Flying Musical Dinner Revue. You will enjoy a fabulous country feast while our large, award winning cast captivates you with a high-energy production including Country, Broadway, 50's & 60's, Bluegrass and Gospel Music. You will also enjoy extraordinary sets, elaborate costumes, spectacular choreography, and state of the art lighting, surround sound and the beauty of the Great Smoky Mountains all without ever leaving your seat. But be on the lookout for bears... you've had dinner and they have not! Read a review of The Black Bear Jamboree. 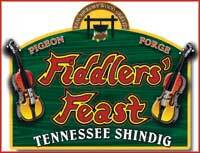 Join us for a mouthwatering feast and spectacular production showcasing the music of Tennessee! From Graceland, to Music Row, to Rocky Top, it�s the music of Tennessee, and you get to taste it, too! Enjoy a hearty meal, lively music, upbeat dancing, and, knee-slappin� humor! And don�t miss our Western shows, Cowboy Christmas Ball, and Chuckwagon and Shindig! Located at Traffic Light #2, call 888-908-FEAST to reserve your spot today. Country Tonite offers the best entertainment experience at the best value! Now in its 12th spectacular season, you�ll find your favorite country classics from country musics most legendary artists along with the country hits of today. This high-energy, full-scale production receives more awards than any other show in the Smokies! Including Show of the Year 2001 -2007! You will enjoy dynamic singing and dancing, side-splitting comedy, powerful gospel, and American patriotism. As a matter of fact you don�t even have to live country music to LOVE Country Tonite! Country Tonite is located in a 1500 seat multi-million dollar theatre with state of the art sound and lighting and 2 giant video screens. First Class Productions, LLC is proud to present our celebrity concert series at Country Tonite Theatre. Legendary performers Loretta Lynn, George Jones, Chubby Checker, Mickey Gilley, Ronnie McDowell, BJ Thomas, Billy Joe Royal, Gene Watson, and many others will be performing this year. 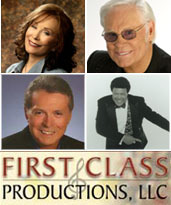 Please visit www.firstclassconcerts.com for our complete concert schedule and other information. The Hoot N' Holler dinner show features a three-course Italian dinner served family style. The two-hour production showcases the Hoot N' Holler Players, a traveling troop of dancers and singers who collide with the comedic antics of "Scraps," the would-be chef and emcee of the evening's entertainment. The show is highlighted by audience participation segments which place unsuspecting guests in the spotlight of this uproarious comedy. The Smokies� best known family of entertainers are back on the stage! Charlie, Jim, and Charlie Bob Smith - three guys who have been fan favorites since first appearing on the scene in the 80�s are back in their very own venue. Guests can look forward to an eclectic blend of country, bluegrass, gospel, and oldies rock-n-roll music, all presented with comedic banter along the way. Any group that does hilarious impressions or performs a musical tribute to the Andy Griffith Show or challenges audience members to a Hula Hoop contest knows how to have fun on stage! Long time fans and newcomers alike are in for a STANDOUT musical experience! Come see why The Smith Family�s show was VOTED BEST SHOW AND BEST ENTERTAINER by the locals! !